Before Sports Team’s biggest headline show yet at London’s Electric Ballroom, their rise within the scene took me by surprise. The name seemed to be on everyone’s lips, Spotify playlists and Instagram stories. They’ve spent the last couple of years in London with packed out shows in The Shacklewell Arms, Birthdays and most recently, Scala. Their growth has been notable, and with the excitement of young adults in their camel t-shirts and dad caps outside the venue, it’s clear they’ve been building their own community. pig are first on stage for the night. After seeing them support Gus Dapperton just one month earlier, there wasn’t a doubt in my mind that they were the perfect way to get the crowd started. Led by eighteen year old Oscar Lang, they play mostly songs from their 2018 album Silk. There is a noticeable difference between the recorded versions to the live performance, though, as they play an energetic and high-tempo set. Even though Electric Ballroom isn’t even at half capacity yet, the end of the performance feels like a headline show has just ended. Filling in for Du Blonde comes support from Walt Disco and even though they ‘only found out we were doing this yesterday’, you wouldn’t think it. 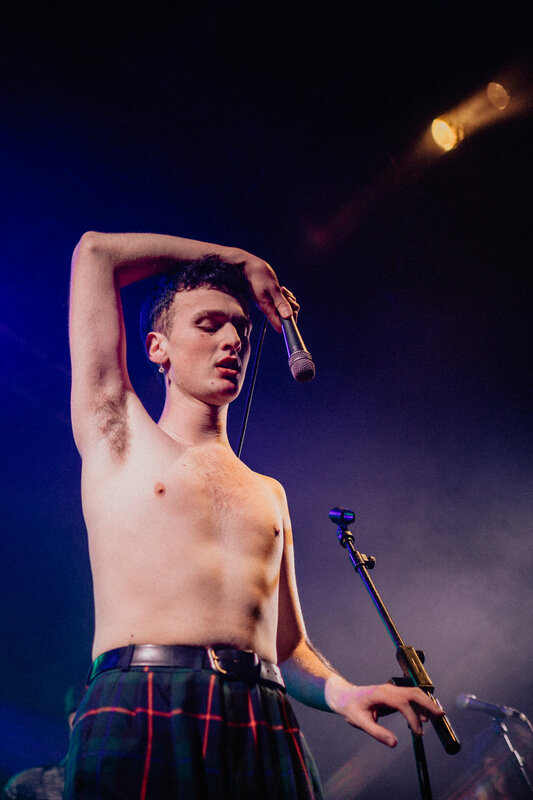 In an eccentric and almost theatrical performance, they seem quite at home here - the frontman’s vocals and movement captures the audience perfectly. Despite only forming the band two years ago, Walt Disco look like they’ve been doing it for years. The lights dim for the main act of the night, and Robbie Williams ‘Let Me Entertain You’ plays over the speakers as the string lights on stage create a warm glow. It feels like it’s foreshadowing the night ahead. Sports Team emerge, with frontman Alex Rice arriving last to a roaring applause. He’s donned a bold red matador suit for the night and really, it suits him. If there was an outfit to summarise his stage personality, this was it. With a short but sweet stockpile of tracks, the band roll through them in quick succession with minimal pauses between them. The momentum is keeping them going, and they’re having more fun with each track that they play. They go through the fan favourites, including ‘Camel Crew’, ‘Kutcher’ and ‘M5’, but truthfully every song feels as popular as the next. Alex Rice takes to the skies by standing on the Ballroom’s speaker system taking most people by surprise, but to the dedicated fans of Sports Team this doesn’t seem out of place. This is part of the energetic stage personality. As balloons drop to cover the fans, pig, Walt Disco and tour members take to the stage to join the final party as Alex heads into the crowd for a crowdsurf to finish the show.